You get a DD 2.0 Stereo Japanese track with player locked English subtitles. The dialogue is clear, and the subtitles are accurately timed and free of typos. The show’s a dialogue heavy, light comedy piece, so it doesn’t exactly set the soundstage alight, while the cast of cute girls get just the sort of voice actor performances that you’d expect. 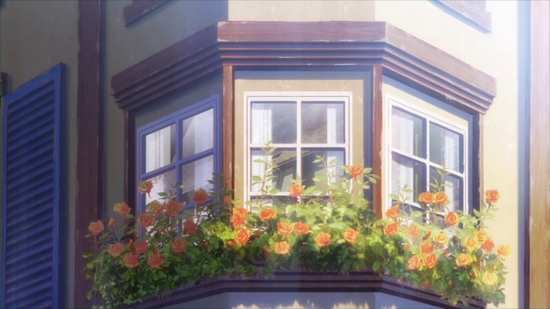 The incidental music suits the faux-European setting well, with plenty of accordion thrown in. The theme songs are an oxymoron, in that that they are catchy and forgettable at the same time. You get two discs in an Amaray case, one on either inner face. Disc 1 autoplays with a trailer for Super Sonico, and you can see it again in the trailers on the disc, alongside One Week Friends, Gingitsune, and Place to Place. You also get the textless opening, and 6 textless closings. Disc 2 offers 6 more textless closings. Ignore my opening paragraph. 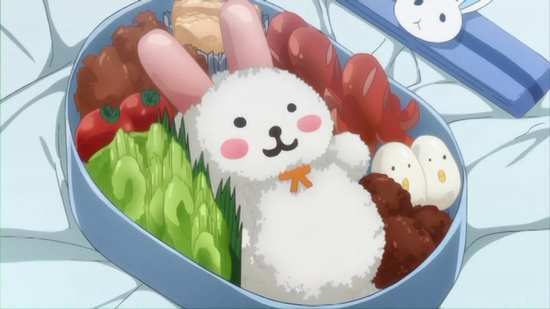 With Is the Order a Rabbit? Season 1, we do indeed hit peak slice-of-life. The cute girls can’t get any cuter, and neither can the cute things that they do. Is the Order a Rabbit? is the show that tries too hard to fulfil its genre responsibilities, and the minute that becomes obvious, is the minute this show slips into mediocrity. It’s watchable, it’s entertaining, and it does give you that warm glow of appreciation that these shows are meant to do, but you can see the swan paddling furiously beneath the surface of the water, and the show loses its elegance as a result. What could be cuter than bunnies after all? The show is set in a picture postcard town where bunnies hop wild, and there’s always a ball of fluff around to cuddle up to. That’s good as protagonist, the enthusiastic and outgoing Cocoa is the cuddling kind. She’s transferred to attend a local school, and immediately gloms onto the cute little girl who works in the bar/cafe where she’s to stay. 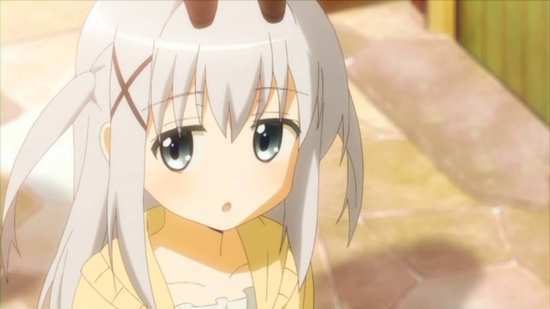 Chino is the cute little grey-haired girl with the slightly emotionless voice (a sort of grown up Renge from Non Non Biyori), who usually has the rabbit Tippy on her head, an Angora ball of fluff (who happens to be her grandfather). 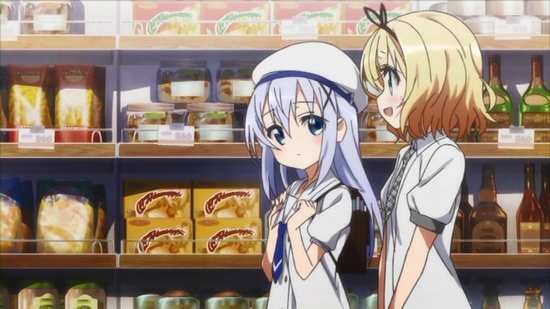 Chino doesn’t like to be hugged, is a little introverted, and certainly doesn’t want an older sister, even though Cocoa has volunteered for the job, as well as working part time in the cafe for room and board. 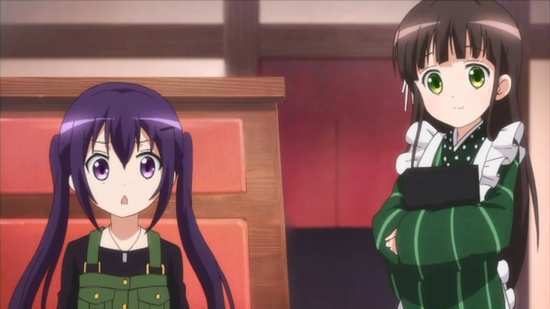 Also a waitress at the Rabbit House is Rize, a tall elegant girl whose family has a military background which has rubbed off on her (she carries model guns), but she’s easily embarrassed. There are a couple of rival cafes as well. Ama Usa An specialises in Japanese sweets, and the waitress there is Chiya, often found wearing a kimono, and with an odd, quirky style, especially when it comes to naming things. 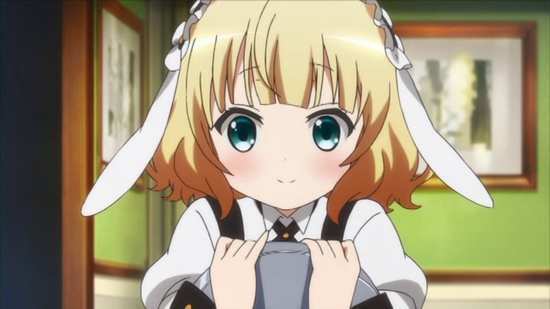 Syaro works at Lapin de Fleur, wearing a bunny waitress outfit, serving herbal teas, and she has a complex about her poverty in the face of everyone assuming she’s a rich society princess, She’s also terrified of rabbits and has a crush on Rize. The show follows the five girls as they hang out and interact. 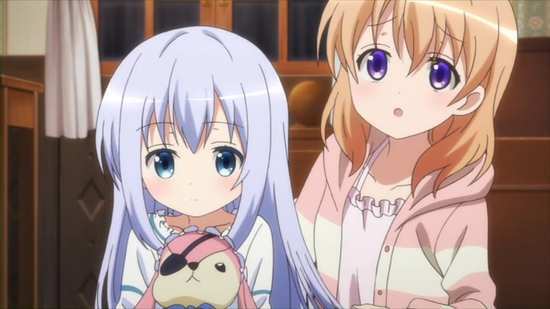 We also meet two of Chino’s friends, Megu and Maya who have more of a role towards the end of the collection. There’s not a lot else I can say about a ‘cute girls doing cute inconsequential things’ show. It goes through the usual motions, the introductory episodes where the characters are initially developed, some fun moments at school, the odd petit drama and the heartfelt resolutions (such as the time Cocoa completes Chino’s jigsaw puzzle for her as a favour), some fun at the swimming pool, and of course a Christmas episode. 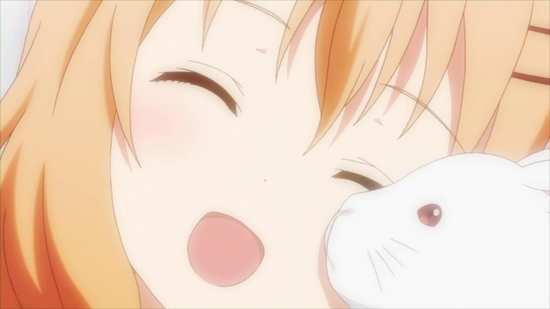 There are a couple of threads running through the show, particularly Cocoa getting close to Chino, and helping her come out of her shell, and there is the bizarre tale of Chino’s grandfather as the rabbit Tippy, as well as a local author by the unlikely name of Aoyama Blue Mountain, and the fond memories she has of Chino’s grandfather who was something of a mentor to her. 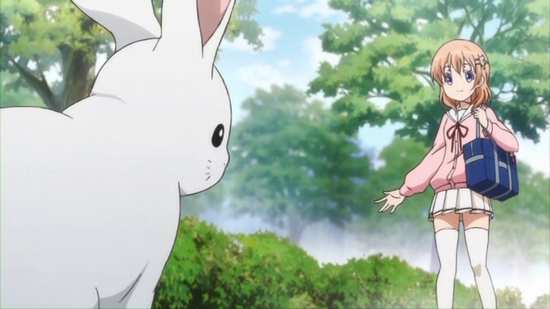 Now it could be that I really have watched one too many of these slice of life shows, but it also could be that Is The Order a Rabbit just isn’t a great one. It doesn’t have that ‘healing’ touch that shows like Amanchu or Non Non Biyori have. Instead it feels like a show that is merely riding on the same bandwagon, appealing to the same audience, but without enough that is special to make an impact. It’s a fun but forgettable little treat, and at least you won’t regret spending twenty minutes on an episode.